Twins. You can’t resist them. In shopping malls, two African American babies in a stroller draw busy shoppers like ants to picnic. You kitchy-kitchy-coo them, touch, pinch, and ogle them. They look so Hollywood cute. And, as these busy shoppers return to the bargain sales which originally drew them to the plaza, they wonder how the parents of this two-for-one special manage to survive the rigors of playing pooper-scooper to two tykes simultaneously. The fact is, over the next several years many expectant African American mothers may have to solve that riddle. Multiple births are up among Black moms. Twins. Triplets. Quadruplets. And more. Over the last several years, twin births jumped 33 percent, while the number of “supertwins” (triplets or greater) soared 178 percent. Is there something in the water? Could be. The fact is doctors do not know for sure what is behind this multiple baby boomlet. The American College of Obstetricians and Gynecologists suspects several culprits: More women defer motherhood until their mid to late 30s, and more women use fertility treatments to conceive. The older the woman, the greater the odds for multiple births. Older women during ovulation may release more than the customary one egg. Add in fertility drugs, which boost the number of eggs a woman releases each month, and in vitro fertilization, where several eggs are fertilized and placed in the uterus, and you’ve got some likely clues to the multiples mystery. Whatever the reason, a mother who learns that she is expecting several bundles of joy will want answers. Fast. That in mind, in this issue of Family Digest Baby, we interview Dr. John C. Jennings, a professor and regional chairman of the department of obstetrics/gynecology at Texas Tech University Health Sciences Center in Amarillo. 1. How common are twins? Before the advent of assisted reproductive technologies (ovulation induction, in vitro fertilization, etc. ), the incidence of twin pregnancy in the United States was approximately 1 in 94. Because these newer techniques frequently result in multiple pregnancy, the incidence of twining has increased significantly in recent years. 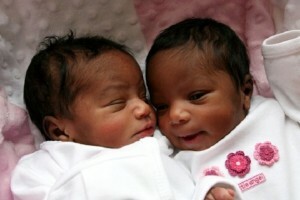 In the United States, about 11 of every 1,000 births is a twin birth. 2. When will my doctor or midwife confirm that I am expecting twins? Doctors suspect twins when the uterus enlarges at a rate greater than expected. The diagnosis is confirmed by an ultrasound examination. The test can reveal the presence of twins at about eight weeks. Because twins and higher order births carry a greater risk of miscarriage, doctors rarely pronounce the twins “viable” until the dawn of the second trimester, at about 12 to 14 weeks. 3. What risks are involved in having twins? There is an approximate five-fold increase in the risk associated with carrying twins. Much of the increased danger results from premature delivery. All multiple pregnancies are, by definition, “high risk.” A woman carrying twins can expect to enjoy more frequent physician visits, ultrasound testing, and testing for fetal abnormalities associated with multiple pregnancies. With multiple births, stillborn rates increase significantly. The additional demands placed upon the mother and the placental system that sustains the fetuses leads to a variety of risks. These risks include high blood pressure, placental problems, bleeding, and other life-threatening conditions. Your chances of having twins or triplets also goes up as you age, even without infertility treatment. As an older mother, multiple births pose risks to your health as well as the babies’. 4. Do twins and triplets develop at the same rate as single babies? Although two fetuses are sharing the same space and nutrients, they develop at the same rate and in the same fashion as single births. They may be a tad smaller — usually because many are born prematurely — than their solo counterparts. In addition, the incidence of birth defects is appreciably higher in pregnancies with multiples. These defects usually occur during the first three months of pregnancy. Twin pregnancies are accompanied by decreased fetal growth rates and low birth weight infants. 5. Do twins develop at different rates? Blood vessel connections in the placenta can create differences in how much nourishment each fetus receives, as can other growth factors. Twins that are genetically different (not identical) may grow at slightly different rates. The babies may even be of different sizes from the beginning.